Earlier in the day I was thinking about what I will be doing once I have completed my initial 90 day round of P90X. Some folks I’m tracking with will be doing a hybrid program of P90X and Beachbody’s Insanity product. They intend to use the more intense cardio from Insanity in place of Plyometrics and Kenpo X. So instead of burning about 480 calories in a P90X cardio workout, you may be upping the burn to around 1,000 calories with the Insanity routines. This idea is appealing when you’re wondering how exactly to get rid of that last bit of belly fat. It seems, if left to it’s own devices, my body would gladly give up an arm or a leg rather than let go of that hard earned blubber. I guess, from an evolutionary standpoint, this makes sense. If you had some belly fat 10,000 years ago, that means you worked VERY hard bringing down that mastodon. And that belly fat would serve you well in the lean times that would surely follow. The problem is, TODAY, not only don’t we have to hunt and kill the mastodon, but its served up to us on a daily basis with a side of fries and a beer. But I digress. Anyway, there I was contemplating introducing the amped up Insanity program into my life as I pushed PLAY on the Plyometrics DVD to begin my workout. Well, after about 30 minutes of squatting and jumping, I was wondering what is wrong with me that I’m actually considering a HARDER workout? It could be a serious mental defect. Although I perform well through Plyometrics, you can make it VERY hard by getting very low in all those squats. I was breathing. I don’t have a heart rate monitor. I just sort of do my best until I see spots of light flashing in front of my eyes. Then I slow it down a bit until my vision returns and the angels stop singing gently in my ears. I bet many of you face the same dilemma as I do during the 30 second “breaks” Tony offers up. Should I use that time to breathe, or should I take a sip of recovery drink? You can’t do both. I usually opt for the recovery drink and try to catch my breath as the next routine begins. But then my great marketing mind kicked in. Why can’t I have both? Why do I have to choose between air and water? 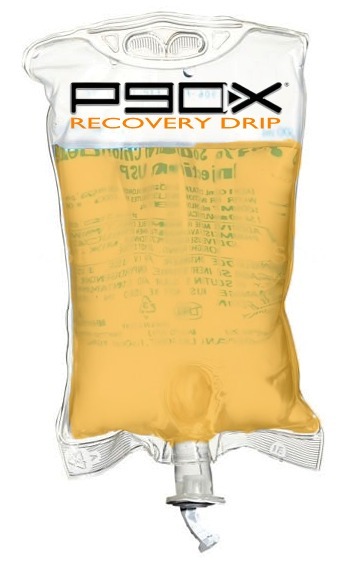 Enter yet another potential product line/annuity stream for Beachbody, LLC: the P90X Recovery Drip. Hook it up and stay optimally hydrated throughout your workout. Don’t keep using the old needles though, that wouldn’t be hygenic. The evening activity was three sets of doubles tennis. This entry was posted in P90X, Round 1 and tagged Belly Fat, Hybrid, Insanity, P90X, Plyometrics, Recovery Drink, Tennis. Bookmark the permalink.